Jenny Haskel kicks the ball up the field. The senior midfielder scored her first goal of the career Saturday. In a 30 minute span on Friday, two things occurred that no one at Martin Stadium had seen before that night. Northwestern scored four goals in a half, and senior midfielder Jenny Haskel found the back of the net. 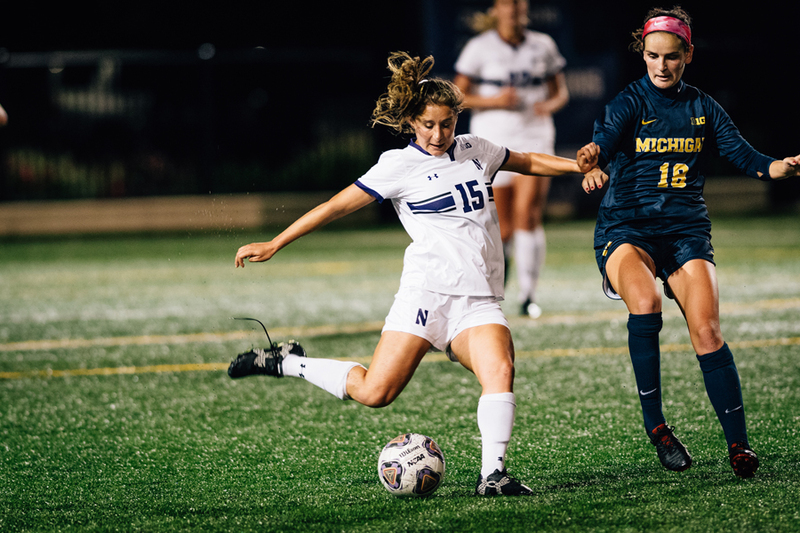 The first two goals the Wildcats (8-2-2, 2-2-1 Big Ten) scored in Sunday’s 4-1 win against Michigan (6-6, 2-3) were exactly what one would expect — organized set pieces leading to uncontested finishes at the net. And then 19 minutes into the game, Haskel found a loose ball ten yards out and ripped it as hard as she could to give NU a 3-0 lead with the first goal of her career. After playing just four games in her first three years, Haskel scored the most memorable goal of the season. Mono sidelined Haskel during her freshman season and two more injury-riddled years followed. But by the beginning of the campaign, she finally reached a point where she could regularly see the field, and Haskel has started in 3 of the 11 games she’s played this year. After getting shutout for 100 minutes in an overtime loss last Sunday, coach Michael Moynihan told the Cats all week that they had to be more aggressive shot-takers close to the net. That hasn’t been Haskel’s strong suit during her career, as her injuries had limited her explosiveness. Nevertheless, she trained with senior defender Hannah Davison during the summer to try to learn how to make more dynamic movements. Moynihan said he’s seeing a difference. Senior midfielder Marisa Viggiano, who led the team in assists last year and is on pace to do so again, said she’s noticed the aggressive approach in Haskel and the rest of the team. NU executed its first two set pieces Friday against the Wolverines, but it’s only possible to create so many of those in a game. The Cats’ fourth goal of the game was another example of their aggressive playmaking. In the 29th minute, senior forward Brenna Lovera beat the Michigan defender in a one-on-one situation down the left sideline before bulleting a cross at freshman forward Haley Lawson, who tapped it in. Almost nothing went wrong for the Cats, according to Moynihan, against a middle-of-the-pack Big Ten opponent.